PLEASE NOTE: the brochure photo and the following text come from ARMS-TECH, by the way of the website http://defensereview.com; the black-and-white picture of the fully suppressed COMPAK-16 comes from the JANE'S INFORMATIONS GROUP, by the way of the website http://www.wapahani.com -- THE PROBLEM: For four decades, bot weapons developers and soldiers have wrestled with a host of problems associated with short-barreled M16 variants, such as excessive cyclic rates, unacceptable barrel life, inaccuracy and low system reliability. Adding to these problems there have been the twin issues of the excessibe muzzle blast and flash - areas of increasing concern. 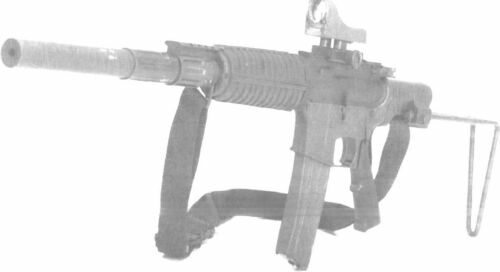 A SIMPLE SOLUTION: To meet this requirement for a reliable and durable .5'56mm CQB-oriented weapon, ARMS-TECH LTD developed the COMPAK-16, which retains all the advantages of the original M16 design while directly addressing the problems of previous designs: the gas system and the barrel configuration. 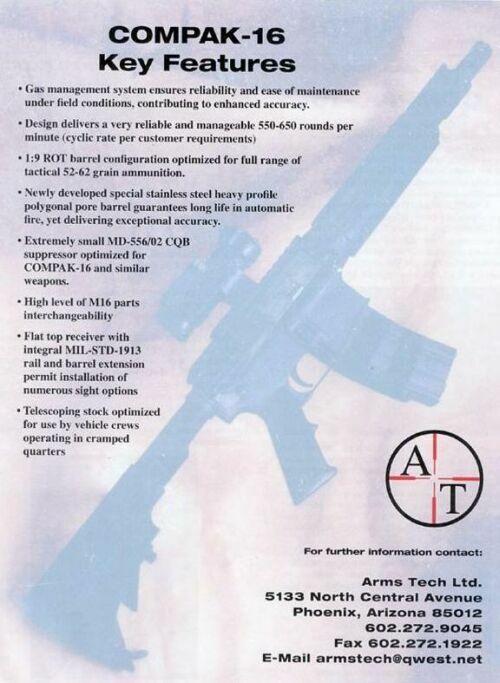 ARMS-TECH's efforts resulted in a 24-inch weapon with 9,5 inch, heavy profile 1:9 polygonal bore extended wear barrel, and their patented gas-trap operating system. This gas management design provides a number of advantages, to include a markedly superior barrel life, improved controllability in burst fire mode, easier maintenance and vastly superior accuracy. The very stiff polygonal barrel is made from a newly developed stainless steel designed specifically for sustained fire with either Vietnam-era M193 or current M855-SS109 ball ammunitions. The .5'56mm cartridge has proven to be superior in CQB applications over the 9mm cartridge and is clearly the caliber of choice in this role. However, SOF and LE communities employing shortened 5'56mm weapons have increasingly reported the following concerns: #1: Short-barreled rifle caliber weapons produce unacceptable flash and blast (noise) levels. #2: Flash reduction is at least as important as sound attenuation. #3: Muzzle flash and blast compromise operator's location, night vision, Tactical Command and Control, and jeopardizes the shooters' hearing health. #4: These problems are exacerbated in confined spaces. #5: A CQB-oriented suppressor must be very compact and have negligible effects on system accuracy and reliability. OPTIMIZED SUPPRESSOR DESIGN: CQB and Entry Weapons in .5'56mm have created serious tactical challenges as well as very real health concerns in the form of permanent bi-lateral high-frequency hearing loss. The use of short-barreled rifle caliber weapons mandated the employment of efficient sound and flash suppressors. ARMS-TECH LTD. has recently developed their extremely robust and compact MD-556-02 suppressor, which is optimized for any .5'56mm Weapons System. Further, it should be noted that the ARMS-TECH suppressors don't detract from systems accuracy. In many cases, ARMS-TECH suppressors designs have been reported to actually improve overall accuracy.